SUN CITY – Colin Brown of Whiteboard Development Co. in Phoenix has been rewarded for showing creativity, passion and backbone in taking a significant financial risk by converting the brunt of the La Ronde Centre mixed-use commercial project built by Del Webb Corp. in the early 1970's into a healthcare facility. In what Brown describes as a “labor of love,” the Phoenix developer took a tired and mostly vacant, 82,841-square-foot neighborhood shopping center at 14262-14820 N. Del Webb Boulevard and turned it into a vibrant and mostly leased, 88,438-square-foot medical office building. 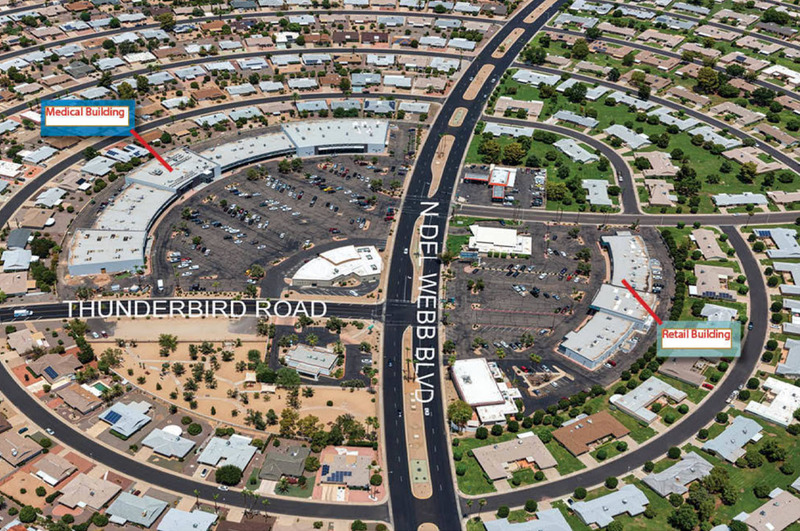 Originally developed as the primary attraction of a 107,753-square-foot, two-building retail-office complex located along both sides of Del Webb Boulevard at Thunderbird Road, the 7.537-acre retail plaza at the northwest corner of the intersection was renovated by Whiteboard in 2015-2016 and the former lifestyle and entertainment project was repositioned as La Ronde Medical Centre. In 2016, the creatively-designed medical facility with large, glass storefront entries was awarded the Medical Redevelopment Project of the Year in Phoenix by the National Association of Industrial and Office Properties (NAIOP). While Brown was pleased with the recognition from NAIOP, the real reward came this past week when a joint venture entity formed by The Carlyle Group of Washington, D.C. (NASDAQ:CG) and Anchor Health Properties (AHP) in Charlottesville, Va. paid $25.25 million ($285 per foot) to purchase La Ronde Medical Centre. Chris Bodnar, Lee Asher and Ryan Lindsley of CBRE Healthcare Capital Markets in Denver, Co. brokered the sale, with assistance from Dylan Brown and Andrew Fosberg of CBRE in Phoenix. Maricopa County records show CPI/AHP Sun City MOB Owner LLC (Carlyle Group/Anchor Health company) acquired the asset with a $8,037,500 down payment and a $900 million credit facility Anchor Health Properties has at Capital One in Chicago, Ill. Sun City Development Group LLC (Whiteboard entity) was the seller. 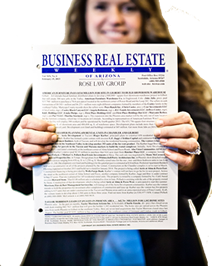 Over the past 25 years, BREW has reported The Carlyle Group involved in numerous real estate deals in the Phoenix market. The global asset manager with $212 billion of assets under management, has invested in multi-family, office and retail properties in the Valley. The Carlyle Group has previously teamed with Anchor Health Properties to buy medical facilities in multiple U.S. markets. Anchor Health Properties, a full-service healthcare real estate development, management and investment company, focuses exclusively on medical facilities. The 30-year-old firm, with 12 offices located throughout the country, has developed more than 2.5 million sq. ft. of healthcare properties and currently manages almost 4 million sq. ft. of medical space. La Ronde Medical Centre, which is 90.3 percent occupied by 9 tenants, is the first investment in the Valley for Anchor Health Properties (Paula Crowley, Lou Sachs, co-founders). The privately-held AHP, which will provide asset and property management services for the Sun City project, has hired Kidder Mathews to handle the leasing. Barnet Dulaney Perkins Eye Center and Comprehensive Interventional Care Centers are anchor tenants in La Ronde Medical Centre, which is located less than a mile from the 501-bed Banner Boswell Medical Center. After the sale to the AHP/Carlyle venture, Sun City Development Group LLC still owns 24,912 sq. ft. of retail and office space on a 3.39-acre parcel located on the east side of Del Webb Boulevard directly across the street from the recently sold medical office building. That portion of La Ronde Centre, developed by Del Webb in 1973, is about 65 percent occupied. Perry Gabuzzi and Margaret Lloyd of Plaza Cos. in Peoria are no longer handling the leasing of La Ronde Medical Centre, but the pair are continuing with the leasing assignment for the retail portion of La Ronde Centre at the southeast corner of Del Webb Boulevard and Talisman Road. That portion of the mixed-use project, located at 14600-14800 N. Del Webb Boulevard, is owned by Brown’s company free of any debt and could be targeted for redevelopment down the road. In August 2014, Sun City Development Group LLC paid $8 million ($74.24 per foot) to buy both portions of La Ronde Centre, which did not include freestanding structures located in front of the medical office project and the retail building. The seller in the deal with Brown’s company paid $18,426,907 ($208.36 per foot) to acquire La Ronde Centre in August 2007. The iconic commercial buildings, located in the middle of a circle surrounded by a maze of hundreds of ranch style homes that comprise the centerpiece of the Sun City community, was a hub of activity nearly 50 years ago when Del Webb developed the project. It was the destination for where many of the active adult residents went to worship, shop, dine or to catch a movie. “This was an absolute passion project to step into the shoes of a visionary developer in Del Webb,” says Brown, referring to the redevelopment. “This was the first lifestyle center in the heart of Sun City. We spent a lot of time on this. It was truly a labor of love.” Over the past five years, BREW has reported Whiteboard taking a selective approach to developing real estate in the Valley with redeveloping existing commercial projects and the ground-up development of The District Lofts, a 172-unit rental community in Gilbert that the company completed in 2017 and still owns. Brown says Whiteboard is working on a couple new projects, including a small, redevelopment of a 20,000-square-foot retail property in the West Valley and a much larger, mixed-use project that will surpass $100 million when built out. Find out more from Colin Brown at (602) 463-5682. Ben Ochs, CEO at Anchor Health Properties and James Schmid, CIO at AHP, are both at (434) 293-8004. Dylan Brown and Fosberg of CBRE in Phoenix are at (602) 735-5555. Reach Gabuzzi and Lloyd of Plaza Cos. at (623) 972-1184.